When I was a teenager, my parents and I made the grand tour of the European capitals. Naturally, this included Rome, which despite the frenetic traffic, had a calm, timeless quality unlike any other city. It certainly lived up to the name the Eternal City. After a long day of sightseeing, we came to the Piazza Navona. In ancient times, this was the site of the Stadium of Domitian, where chariot races and other competitions took place. However, it assumed its present form in the fifteenth century when the area was paved over to become a long oval piazza, which served as the city's main market square for three centuries. Piazza Navona's best known features are its three Baroque fountains. The middle fountain, which serves as the base for an Egyptian obelisk was designed by Gian Lorenzo Bernini and has figures personifying four of the world's great rivers. The other two fountains - - one at each end of the piazza - - were designed by Giacomo della Porta, although Bernini contributed a statue to the fountain at the northern end of the piazza. Facing the Fountain of the Four Rivers is the church of Sant'Agnese in Agone. They say it is on a site where a miracle associated with St. Agnes took place. Completed in 1670, the elaborate front facade is considered the masterpiece of Bernini's main rival, Francesco Borromini. The rest of the square is lined with Renaissance palaces, which have been converted to modern uses without spoiling their integrity. The net result is that the Piazza Navona is a beautiful place. Both locals and tourists flock here. Some come to see the architecture, some to enjoy the sun, but most just sit in a cafe and watch the world go by. We stopped at a cafe that specialized in ice cream - - just the thing for a warm late August afternoon. The specialty of the house was a dish of dark chocolate ice cream. Embedded within the ice cream were chunks of delicious dark chocolate. Sitting at an outdoor table, we each finished one, then another and yet another. It was a simple dish but the best dessert ever. As the years went by, I tried many desserts - - souffles, Black Forest cake, bananas foster, crepes, mint chocolate chip ice cream. Quite a few were excellent. However, as my friends undoubtedly became tired of hearing, nothing could equal the legendary ice cream from the Piazza Navona. At one point, a woman who I was in love with introduced me to her favorite dessert. She called “tartufo,” which means truffle in Italian. It can be described as a ball of ice cream, half vanilla and half chocolate, within a shell of thick dark chocolate. At the center, there is usually a cherry and some chopped nuts. Although that relationship subsequently evaporated, tartufo has maintained an exalted place in my pantheon of great desserts. Of course, it is not quite up to the epic dessert from the Piazza Navona. During my travels, I returned to Italy and to Rome several times. However, circumstances never permitted me to go back to the Piazza Navona. 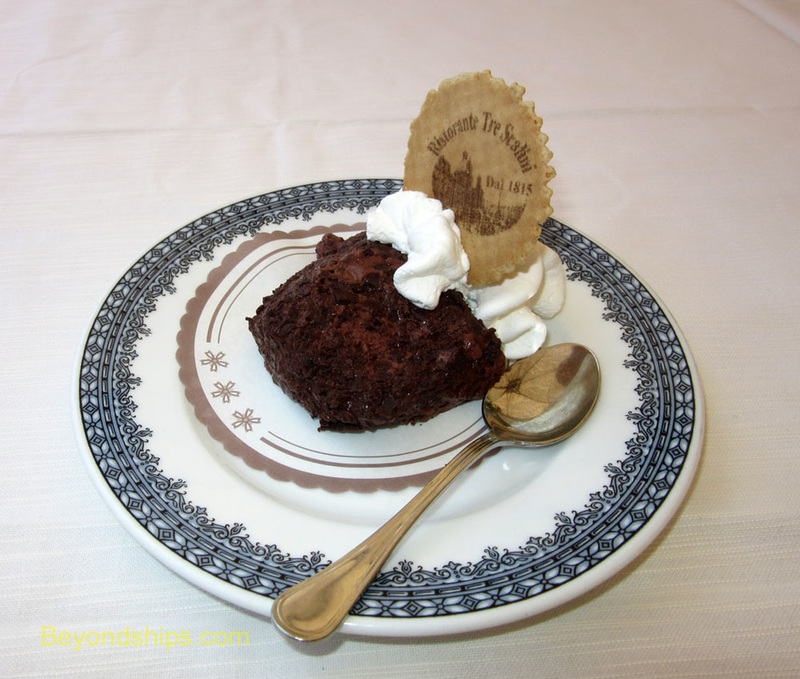 Therefore, I vowed to make a special trip to the Piazza Navona this year during Anthem of the Seas' call in Civitavecchia so that I could once again sample the greatest of desserts. This quest was not without peril. Perhaps the charming cafe where we had had the dessert had become a fast food joint. More daunting was the prospect that the dessert would not be as good as remembered. I arrived in the Piazza Navona in the early afternoon. As one of Rome's premier tourist destinations, the piazza was crowded with people. It is now pedestrians only Still, it looked much like it did when I was there a few centuries before. One difference was that there seemed to be many more restaurants. Indeed, most of the circumference of the piazza seemed to be lined with restaurants. And they all seemed to have outdoor tables and umbrellas like the one that served the great dessert. My spirits began to sink as I walked along scrutinizing each establishment. I did not know the name of the cafe where my family had eaten so many years earlier and beyond remembering that it was in the piazza, I had no real idea of its location. 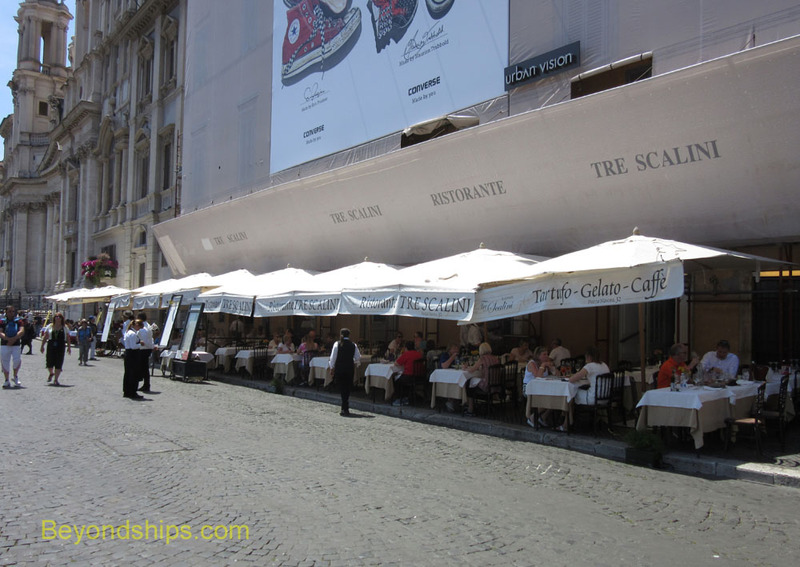 Eventually, I stopped in front of Ristorante Tre Scalini just north of Borromini's church. This place seemed somewhat familiar but there was restoration work going on above the restaurant and the facade of the building was covered. The familiarity might also just be wishful thinking. Tartufo? My ears perked up. My quest was clearly a failure but what could be better consolation than to sit in the beautiful Piazza Navona enjoying a dish of tartufo. I sat down at one of the outdoor tables and ordered a tartufo. While the waiter was gone, I watched the street performers and the tourists go by. Even without the chariot races, it was a nice place just to be. It was one of those moments when it is just good to be alive and so I cast off my regrets. After a few minutes, I saw the waiter come out from inside the restaurant, nonchalantly carrying a dish in one hand. He circled around the other tables and then laid the dish in front of me. This was unlike any tartufo that I had seen at home. It was dark chocolate ice cream with pieces of dark chocolate embedded within. It was the lost dessert. My quest was accomplished. It is still a great dessert. Above: The Ristorante Tre Scalini.